INFINITE HAIR EXTENSIONS CLIP-IN HAIR MEDIUM TEXTURE STRAIGHT 6"
Create a curved section from temple to temple and attach middle clip directly in the center of forehead and secure. Follow by securing right and left clip. Create a curved section from middle of forehead to either side of head. Secure the right or left clip ocenter of forehead. Follow by securing middle and end clip. 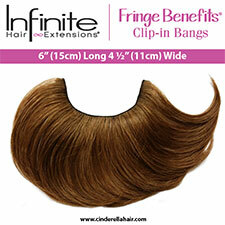 FRINGE BENEFITS CLIP-IN BANGS OFFER YOU THE MOST NATURAL WAY TO CHANGE YOUR LOOK IN SECONDS. OUR UNIQUE SEMICIRCLE DESIGN ALLOWS YOU TO WEAR THEM STRAIGHT DOWN FOR A FULL BANG OR ANGLED SLIGHTLY TO THE RIGHT OR LEFT FOR A SIDE SWEEP. INSTANTLY COVERS LARGE FORHEADS, RECEDING HAIRLINE AND GIVES THIN SPOTS INSTANT THICKNESS. EVERY FRINGE BENEFITS CLIP-IN BANG IS 6” (15cm) LONG AND MADE OF 100% HUMAN REMY HAIR WHICH HELPS TO ELIMINATE TANGLES AND MATTING BECAUSE THE HAIR CUTICLE IS ALL IN THE SAME DIRECTION – SAME AS YOU OWN HAIR. 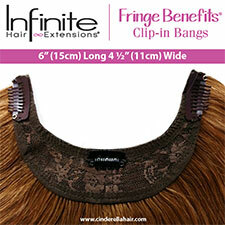 THREE POLYMER COATED CLIPS HOLD FRINGE BENEFITS IN PLACE AND ENSURE NO DAMAGE OR DISCOMFORT TO YOUR HAIR AND SCALP. BREATHABLE FABRIC STITCHING AT THE BASE ALLOWS AIR TO FLOW REDUCING PERSPIRATION WHEN FRAMING YOUR FACE AND ADDS ADDITIONAL VOLUME.